Borderland Narratives, the three-day long festival of films from Contemporary Northeast India came to a successful end at the Rajiv Gandhi University (RGU) campus on Tuesday. In all 19 filmmakers representing the eight states of the north-eastern states participated in the festival and shared their films and diverse cultures. Addressing the valedictory ceremony of the festival, RGU vice-chancellor Professor Saket Kushwaha declared making the festival a calendar event and announced to provide Rs five lakh from the university funds. Appreciating the theme of the film ‘Chori’ directed by Tribeny Rai from Sikkim, Professor Kushwaha stressed on the importance of a girl child in society. “Our society needs to change its attitude towards a girl child and the best way is to showcase the reality is through films. Being the torchbearers of society, the filmmakers need to bring changes in different aspects of life,” he said. 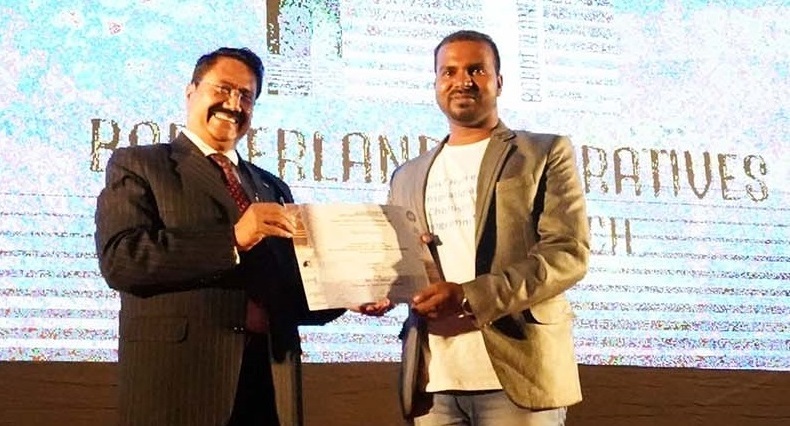 The short film competition saw ‘Ya:Yo’(Grandmother) directed by Amalendu Kaushik from Assam being declared as the winner, while Toni Perme of Arunachal received the special jury award for his film ‘Badu: Lament of a fleeting Soul‘. The winning film has received a cash prize of Rs one lakh while the special jury awardee got richer by Rs 25000. ‘River Story‘ by Yapangnaro Longkum, ‘The Vanishing Roots: Apatani Language and Culture‘ by Dulley Tamang, ‘Sweet Lemon‘ by Tanom Jerang, ‘Pialral-Ah‘ by Napoleon R Z Thanga, ‘Vanishing Roots‘ by Tage Apa were the other films nominated for the short film category. The last segment of the festival saw the screening of ‘Chori‘ directed by Tribeny Rai and ‘III Smoking Barrels‘ directed by Sanjib Deywas. Films including ‘Songs of the Mist‘ by Kivini Shohe (Nagaland), ‘Haja‘ by Emang Debbarma (Tripura), ‘Ma Ama‘ by Dominic Sangma (Meghalaya), ‘Mighty Brahmaputra‘ by Bappa Ray from Indira Gandhi National Centre for the Arts (IGNCA), ‘Dhokbu‘ by Dawa Lepcha (Sikkim), ‘Sulhnu‘ by K C Zoherliana (Mizoram) and ‘Orunasol Man‘ by Nyago Ete were also screened on day two of the festival.